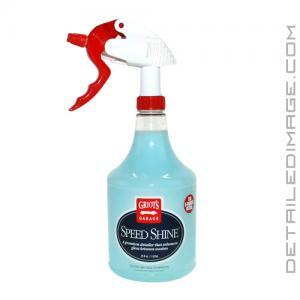 The Griot's Garage Speed Shine quick detailer allows you to quickly and safely keep your paint, wheels, chrome, glass, and exterior trim clean! This high lubricity detail spray encapsulates particles allowing you to safely remove any dust and debris that has accumulated on your car since its last wash in a matter of minutes. This way you don't have to wash a freshly detailed vehicle with light surface contamination. You can simply use the Speed Shine to quickly clean up the surface. Just spray a section of your vehicle, wipe it away with a clean microfiber towel, and you will have an extremely clean surface with a great shine! The high lubricity and cleaning power makes it also great as a clay lube. It will help the clay bar glide safely side to side without marring the paint. If you are looking for a versatile quick detailer to safely remove dust, fingerprints, and light dirt, while maintaining a clean, brilliant shine, grab yourself a bottle of the Griot's Garage Speed Shine! Thank you for selecting this quality Griot's product. 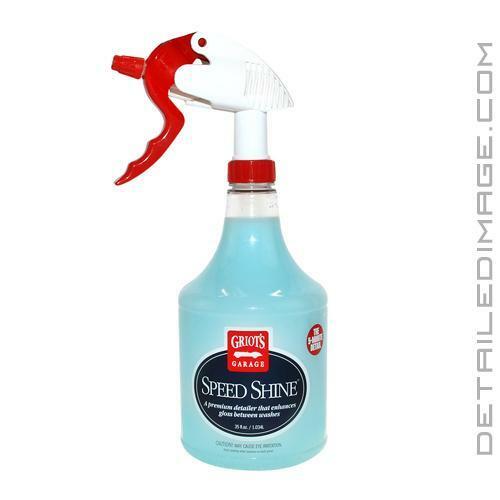 Speed Shine is perfect for removing dust, dirt, bird droppings, tree sap, and other contaminants before they cause damage to your paint's surface. Safe for cleaning paint, painted wheels, rubber, plastic, glass, and chrome. Ideal as a lubricant for our Paint Cleaning Clay. Enjoy the best! Useful Directions: Shake well before use. Paint surface should be cool. Working in small areas, spray Speed Shine onto the paint and wipe off with a Micro Fiber Speed Shine Cloth. Do not allow liquid to dry on the surface. Turn cloth frequently so there is always a clean area of cloth with every wipe. Do not bear down hard on paint. Buff dry with a separate, clean cloth. This is a great quick detailer. Use it as a lubricant for playing and in between washes. Best I have used. I have tried almost every QD on the market and for me this one works the best of any. It wipes of with minimal streaking and works well on hot ,black paint. Until now Sonax QD was my go to QD but Speed Shine out performs it and is a better value as well.